With today being Mothering Sunday entries for the last two races in the Snowdrop series was low. Just five boats took to the water for the first race in a stiff force 4 to 5 ENE wind. 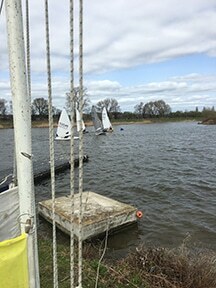 Although there were five different boats involved ranging from Phantom to Laser Radial racing was close for the first lap but thereafter the Radial gradually lost ground. Kevin Milton in his Nick Marlow ably crewed by Ruth Marlow actually crossed the finish line together such that the same time had to be given to both. Kevin Last crossed the line in third place, Ray Kemish was fourth across the line after managing to try some mud yachting at one point and finally Jeff Marshall in his radial came in approximately 7.5 minutes after the leaders. Overall winners were Nick and Ruth Marlow from Kevin Last and Ray Kemish. Four boats went out for the second race after Jeff decided one was enough. Just 22 seconds separated the four boats after lap 1 and this close racing continued throughout the race with quite a number of changes in leader. Unfortunately Nick Marlow managed to find the shallows and lost a lot of ground which he struggled to make up. After six laps and just over 50 minutes racing just 2 minutes and 29 seconds separated Kevin Milton in his Phantom and Ray Kemish in his Laser. Ray won on handicap by 3 seconds from Kevin Last with the Marlows a further minute behind. All this meant Duncan Adams was rewarded for his Mothering Sunday duties, winning the series overall despite not sailing, with Kevin Last second, Ray Kemish third, Kevin Milton fourth and Louis Mok fifth. Wednesday and Spring Series start this week.